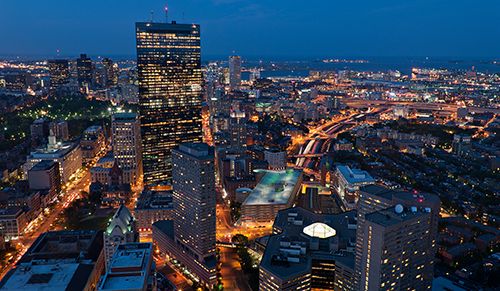 This post is part of a series marking the release of The Intersector Project’s new report The Development of Boston’s Innovation District: A Case Study of Cross-Sector Collaboration and Public Entrepreneurship. For much of the 20th century, particularly after the postwar exodus from city centers to suburbs, the separation of economic development and Placemaking strategies has led to a bleak landscape of “innovation” in the United States and around the world – one that has been dominated by remote office parks and corporate campuses in areas like Silicon Valley and Boston’s Route 128 Corridor. In this model, the corporations, firms, and universities that have been driving innovative economic development have removed themselves not only from the life and energy of the city but also from the spontaneous transfer of ideas and skills that this kind of proximity affords. While focusing exclusively on research, output, and the isolated production of knowledge, these suburban complexes have assigned little value to the importance of community, connectivity, or personal investment. In short, they lacked a focus on place. At Project for Public Spaces (PPS), we see often how focusing on place can work to break down silos among sectors and within government and professional fields. And when we start to break down these silos, when we start to lead with people and place, it quickly becomes clear that place attachment translates to economic and social capital – and it’s what will ultimately make our cities more innovative, distinctive, and competitive. Many movements and causes are starting to converge around place as a way to generate innovative solutions and achieve multiple outcomes at once. To explore and advance the connection between innovation and Placemaking, Project for Public Spaces has just announced a new partnership with the Brookings Institution to establish the Anne T. and Robert M. Bass Initiative on Innovation and Placemaking. While tech hubs and R&D institutions are certainly key points on the spectrum of innovation, this partnership will take a more wide-angle approach in thinking about the productive relationship between place, Placemaking, and innovative growth. Brookings has already developed a body of research identifying the key characteristics of innovation districts, documenting the corporations, startups, educational institutions, accelerators, and incubators that comprise these areas. They’ve also highlighted various typologies of innovation districts that already exist in cities around the world. When we start to break down these silos, when we start to lead with people and place, it quickly becomes clear that place attachment translates to economic and social capital – and it’s what will ultimately make our cities more innovative, distinctive, and competitive. Recognizing the link between Placemaking, economic development, and urban growth, the Bass Initiative will continue this research and broaden the framework to include other types of emerging vibrant commercial and cultural districts, while looking closely at the powerful role of public spaces within these networks. Anchored by assets such as universities, medical campuses, historic warehouses, waterfronts, main streets, and public markets, these urban clusters can serve not only as breeding grounds for innovation and creativity but also as treasured destinations for the communities they serve. 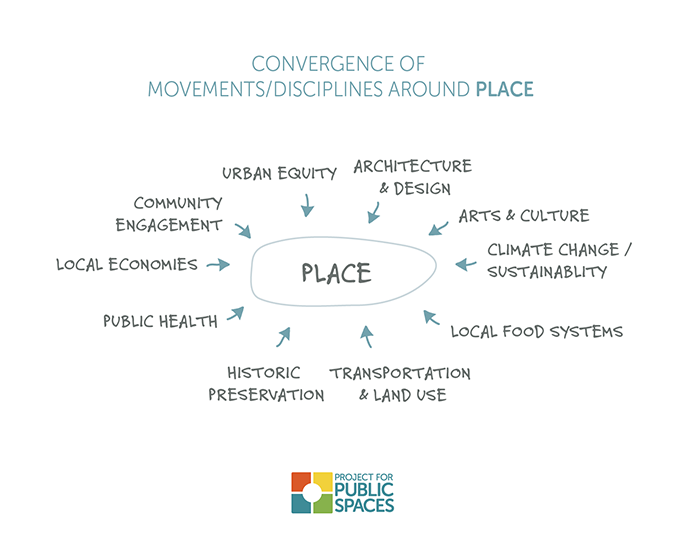 While many social movements and organizations have often found themselves in constant competition for attention and limited resources, a collective focus on place can be an effective way to mobilize, and more fundamentally address, these otherwise disparate causes. A shared focus on our relationships to place can shift our human relationships, our patterns of urbanization, and our collective capacity to address challenges on multiple scales. Throughout much of the recent past, the story of cities has been one of expensive infrastructure and the unilateral vision of the “expert.” What is often left out of this story of city-building is the importance of public space and the perspectives of the everyday people who continue to create and use it. Today, with a renewed interest in cities, a squeeze on municipal budgets, and a millennial-driven culture for disruptive change, a very different story is beginning to emerge. It is a story that focuses on what people do in cities, how our shared experience in cities drives both competition and collaboration, and how citizen participation is the key component in making them thrive. It is a story of emerging creativity, of cultural evolution, and growing shared value in our public realm – It is a movement around Placemaking. The future of thriving and resilient cities will not be led by innovations around infrastructure and services, but by building the capacity of communities to drive their own shared value. If the ultimate goal of governance, public institutions, and development is to make places thrive, then governance culture and processes need to change to reflect that goal. 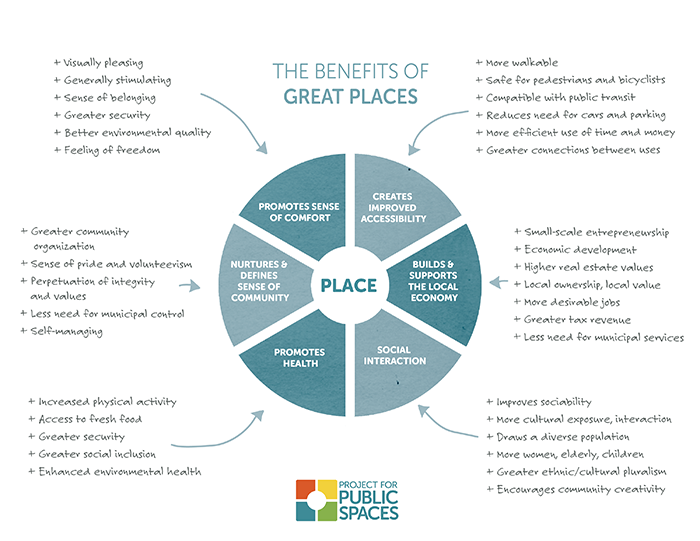 Place certainly does not represent all of the public good and value in a community, but place as an organizing focus can best help that value be preserved, shared, and leveraged. Shifting power and responsibility for governance to communities allows for more efficient and dynamic models to emerge. More networked community relationships diversify skills and resources and support more adaptability. People in power, and professionals, no longer have to have all the solutions and focus on selling them, but can instead gain power to lead change by acting as facilitators, resources, and inspirations to change. The future of thriving and resilient cities will not be led by innovations around infrastructure and services, but by building the capacity of communities to drive their own shared value. The focus of government can go beyond just delivering better places to live, but building capacity for communities to preserve and create their shared wealth in the public realm. If we start to see our cities and communities as something that we can shape through human scale, affordable, and short-term changes, the possibility for collective change becomes greater and more approachable. A focus on Place Capital, or the shared wealth of communities, can help to achieve and leverage a number of smaller goals. From equity to public health, from landscape urbanism to smart cities, many disciplines and social movements have traditionally approached global problems with innovations that relate only to their own independent interests and solutions – and the communities that each of these institutions or causes are meant to serve are as removed as ever from the solutions. Fortunately, many of today’s cities are beginning to recognize that the constant exchange of ideas, resources, and talent that fuels all innovation is a direct product of the interplay between inventive people and the physical places they share. A focus on place and Placemaking can be the grounding mechanism for change and innovation. Project for Public Spaces is a 40-year-old non-profit that has facilitated cross-sector collaborations for transforming places in 3,000 communities in 46 countries. Placemaking projects are often initiated by one sector, and facilitating collaboration between multiple sectors while also building shared governance capacity is crucial to the success of our work. PPS also operates on city-wide, national, and international levels to help “turn upside-down” the way we shape our cities by starting with people and places.